Stainless Steel 1 2/3" Newel Post Wall Mount Stainless Steel 1 2/3" Newel Post Floor Mount Stainless Steel Flange Canopy 2 63/64" Dia. x 37/64" Dia. Hole x 1/2" Stainless Steel Round Bar 1/2" Dia. 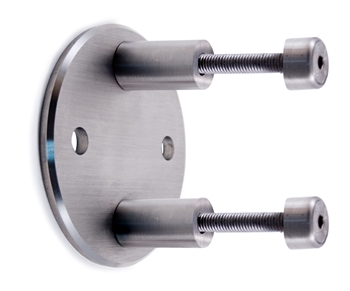 x 9' 10"
Stainless Steel 1 2/3" Newel Post Floor Mount Stainless Steel Flange Canopy 4-9/64" DIA x 1-11/16" DIA Hole x 19/32" H Stainless Steel Bar Holder 9/16" Dia. Hole for 1 1/3" and 1 2/3" Tube Stainless Steel Tube 1 1/3" x 9'-10"